A SUV is a great way to travel with your family. You have plenty of space for storing your suitcases and other gear, and everyone has room to sit comfortably. Another advantage to traveling in a SUV is the vehicle’s versatility. When it is time to stop for the night the seats can be folded down to create a spacious sleeping area that has room for everyone. While a few sleeping bags and a couple of pillows will give you a relatively comfortable place to sleep in your SUV, you could easily turn it into an affordable and fun camping adventure that everyone in your family can enjoy with the addition of a truck tent. A SUV or truck tent is the perfect way to travel and camp with your family. These tents are generally easy to set up, and take down, and most are manufactured to fit almost any model SUV. The tent is designed to attach to the back of the vehicle to add more sleeping space so you and your family can enjoy a comfortable night under the stars. One truck tent that is popular with SUV owners is the 82000 Sportz. Since it measures 9 x 9 feet you will have plenty of room for everyone to stretch out, and with 7 feet of headroom even taller adults can move around comfortably. You will love how easy this truck tent is to set up, one person can do it without any help. This allows you to quickly set the campsite up and get back to enjoying your outdoor adventure with your family. Since the weather during camping is not always pleasant, the tent is designed to keep everything safe and dry ( click here to read more on this subject). The floor is designed to keep water and moisture away from your gear, and the tent also comes with an effective rain protection system. 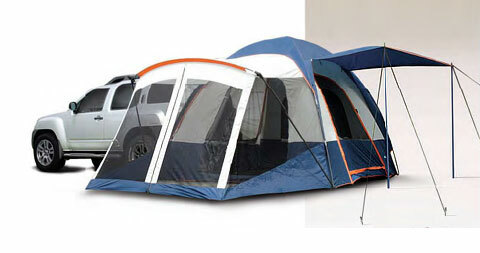 Even during thunderstorms you and your family can still have a fun camping trip with this truck tent. SUV camping is gaining in popularity, especially with families. It is a more affordable option than spending the night in hotels along the way, and it allows you to experience all of the fun and benefits of outdoor camping without any of the discomfort. Whether it is for a night or an extended trip, a SUV or truck tent might be just what you need to have a great outdoor adventure that you and your family will never forget. June 5, 2016 by	Robert C.